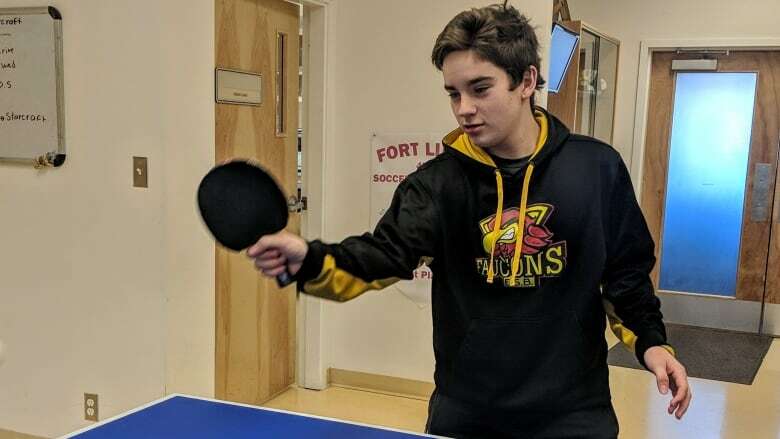 A Hay River, N.W.T., teenager is going to compete in the 2019 Canada Winter Games after teaching himself to play table tennis by watching YouTube videos. A teen from Hay River, N.W.T., is going to compete in the 2019 Canada Winter Games in table tennis after teaching himself to play by watching YouTube videos. Conner McKay-Ivanko, a Grade 10 student at École Boréale, said he first became interested in the sport after playing recreationally at school. Last year, he started playing it more seriously. But without many learning opportunities in the town of about 3,500 people, he had to take a solo approach. McKay-Ivanko, 15, estimated that he's now practising for about 15 hours a week: "Every weekend, every lunch, every day after school." He plays with friends in town, even though he doesn't have a trainer and qualified for the Canada Winter Games last year. The Canada Games, which date back to 1967, are Canada's largest multi-sport competition and several athletes who've competed have gone on to the Olympics. Red Deer, Alta., is hosting the games this year between Feb. 15 and March 3. Up to 3,600 athletes and others involved in the sports are expected to attend. "It's a very big deal. It really is a life-changing experience for a lot of these young people," David Patterson, president and CEO of the Canada Games Council, said in a phone interview. He said, to his knowledge, an athlete who learned a sport solo by using YouTube is a first for the competition: "I think that's a wonderful story." McKay-Ivanko leaves town for the competition on Wednesday. He said he's a little nervous, but he's proud to represent the Northwest Territories and he's looking forward to giving it his all. "This is will be my first competition I've ever participated in," McKay-Ivanko said. "I'll be happy no matter what. It's just going to be a great experience."